What would it be like to run a business with your BFF? Sounds like non-stop fun times with the most supportive of colleagues to us. Illustrator and Papier collaborator Jade Fisher knows. Her best friend Lauren McCubbin has been helping her around the studio and at trade shows since 2015 but took on a full-time role at the end of last year. How did you first meet each other? Jade: In the first week of secondary school. Lolly was sat across the classroom in a music lesson, wearing a choker chain, and said she liked Stereophonics. So I thought she was cool and wanted to make friends. Then I met her and realised I couldn’t have been more wrong about the ‘cool’ thing. Lauren: It was in Year 7, on one of the first days at school. I made a comment about Stereophonics to a teacher hoping that everyone would think I was cool and make friends but turned out nobody cared… except for Jade. She quickly learned that I am not cool but we became friends anyway. "None of it would be as fun without her"
How would you describe the other one? Jade: Very funny, very angry, the best person to have on your side. She’s always got your back. Lauren: A beautiful, talented, brilliant, powerful musk-ox. What's it like working with your best friend? Jade: While it really is our childhood dream come true, it’s also a little bit scary. As I started the business on my own and then Lolly came on board, I feel like it was a leap of faith for her to join me and I’m always checking that she’s enjoying her job and things are going in the right direction for both of us to have a fulfilling career. But we just know each other so well, it makes everything so easy. Lauren: Better than any job I’ve had. It feels weird even calling it a job. Do you still hang out with each other outside of work? Is there a boundary between work and social occasions? Jade: I actually think we do hang out a little less outside of work these days, but maybe that’s because we both turned 30 recently and when 6pm comes now it’s time for home and PJs. We are learning to have boundaries in the studio. If one of us is having a rubbish day, it’s impossible to hide and keep it out of the office, but we’re trying to designate friend time and work time to keep the balance. Luckily, I think we both find it very easy to close the door at the end of the day and go back to being best friends. Lauren: Yep, work hasn't changed it or got in the way. It’s actually all too easy to slip into casual mode so we have had to talk about when to be serious and switched on rather than just being silly. Lauren, what do you think of Jade's illustrations of you? I love them! They always make me laugh-cry when I first see them – especially the Gal Pals one. It’s the rough drafts and personal illustrations that get me the most though, nothing like a BFF to keep you in check. Jade, what's your favourite thing about drawing Lauren? Jade: I like that I’ve always drawn her over the years, so I have an illustrated time line of her evolution and her bad hair decisions. What do you love about the other one? Jade: I love her loyalty and dedication to silliness! There has never been a time when I’ve gone to her with an idea or a plan and she hasn’t just jumped on board straight away. She’s by my side no matter how dumb the suggestion may be, and I love that because none of it would be as fun without her. Lauren: Her dogs, her unwanted clothes and her leftovers. But mostly, her ridiculous sense of humour, her love of the outdoors and food, and her strength. Can you recount the all-time loveliest thing you’ve done for each other? Jade: I was feeling a bit down and it was my birthday, and she cooked a huge tapas feast for us – it was the best home cooked meal I’ve had. I think I just slumped to her dining table with a blanket around me. I think feeding someone is the loveliest way to look after them! Lauren: For me, Jade organising my surprise 30th Birthday party is pretty unbeatable. But generally, just being there for dog walks and coffees at any time of need is the most important. Why do you think it's important to celebrate female comradeship? Jade: Because women are so often pitted against each other, and it’s so much better when we stick together! We all share this deep intuition which makes for incredibly strong bonds and supportive friendship, which we should all be focusing on over rivalry and mistrust. Plus, if female friendship has its own designated day for celebration, we get to eat cake. Lauren: Because it's too easy to take it for granted or to become competitive instead of supportive of each other. Female comradeship means you can share your problems – and share your clothes. How will you be celebrating Galentine's Day? Jade: We’ll probably treat ourselves to a nice lunch or bring in cake, and we’ll play our ultimate Girl Time Party Playlist all day in the office and probably have a little cry about how much we love each other. So just like any other day really. What Papier Picks are you giving the other one for Galentine's Day? Jade: I’d definitely pick the Sloth notebook for Lolly. She used to work in a zoo! Then the Spotty Snake stationery set, because again – animals – and nobody is ever too grown up for cute animal stationery, and it’s absolutely adorable. And the Statue of Liberty notecards in memory of our New York trip last year. Also, the gorgeous photo books for sure. I hate that all our photos are just on a screen now and I always have every intention of printing them but never do. I really like the colour block covers (pink, of course). Lauren: The Tropicool notebook & notecard set because the ferns remind me of Jade. She loves ferns and always has plants around the studio and trade shows. The Jag by Desmond & Dempsey notebook. Moomins stationery because the Tove Jansson page in our calendar was Jade's favourite illustration to do, and a photo book because they are always awesome gifts. 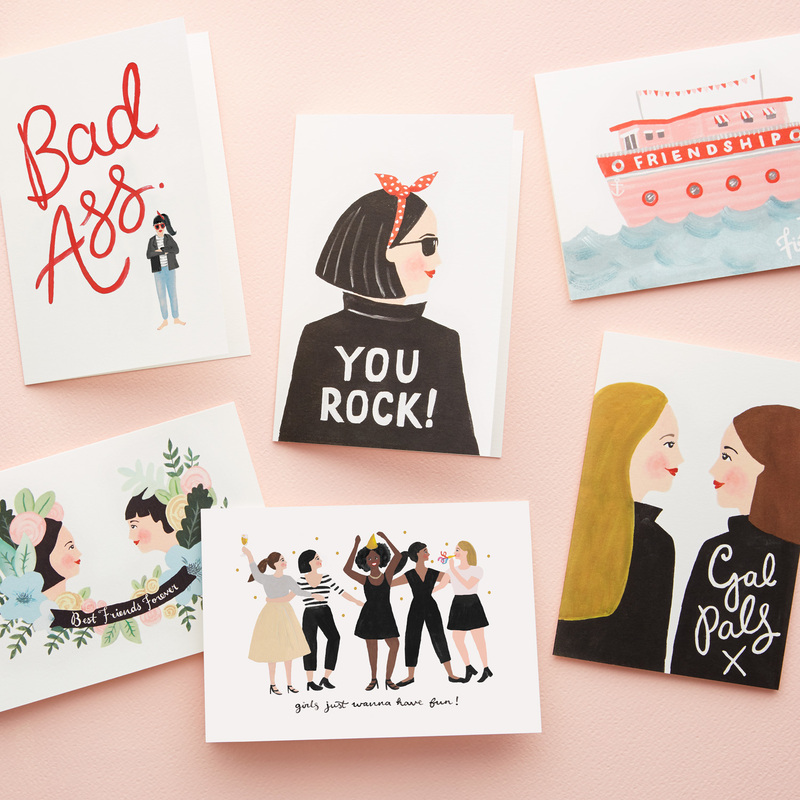 Tell your gal pals that friendship never ends with our range of Galentine's Day cards.